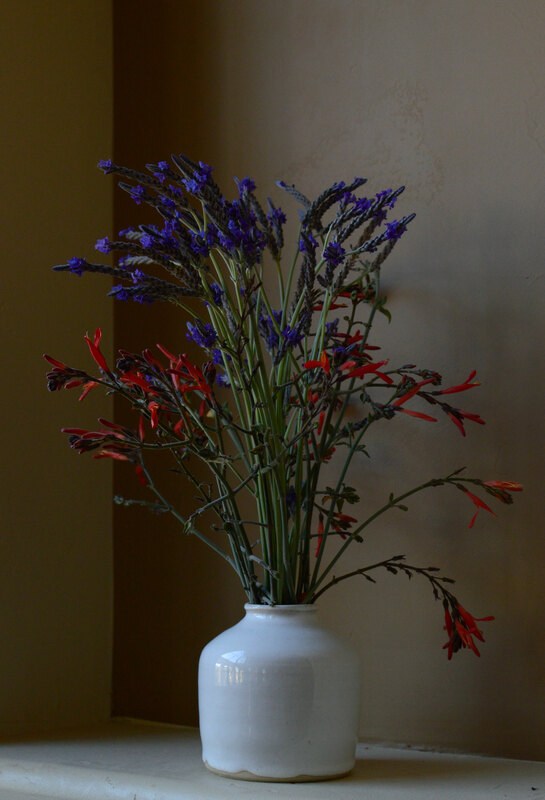 It was just two classic dry-country flowers for today's vase - one from the Mediterranean, the other a Sonoran native. 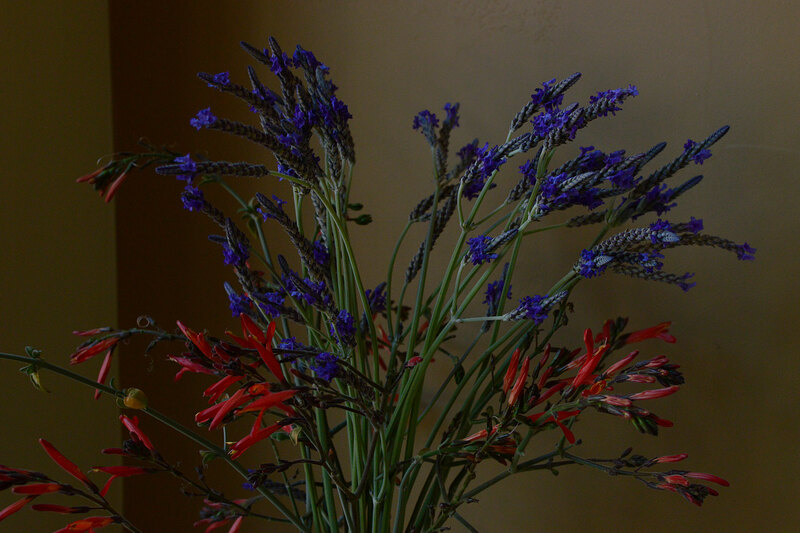 ...and the scarlet-orange of Justicia californica, known as chuparosa because the sipping hummingbirds find it delectable. Both plants grow in the North Border and manage to bloom on little supplemental water, mostly just runoff from adjacent plants. I suspect the chuparosa would actually bloom better in an even harsher situation. As it is, it keeps attempting to spread throughout the border but has only now begun to really come into flower. 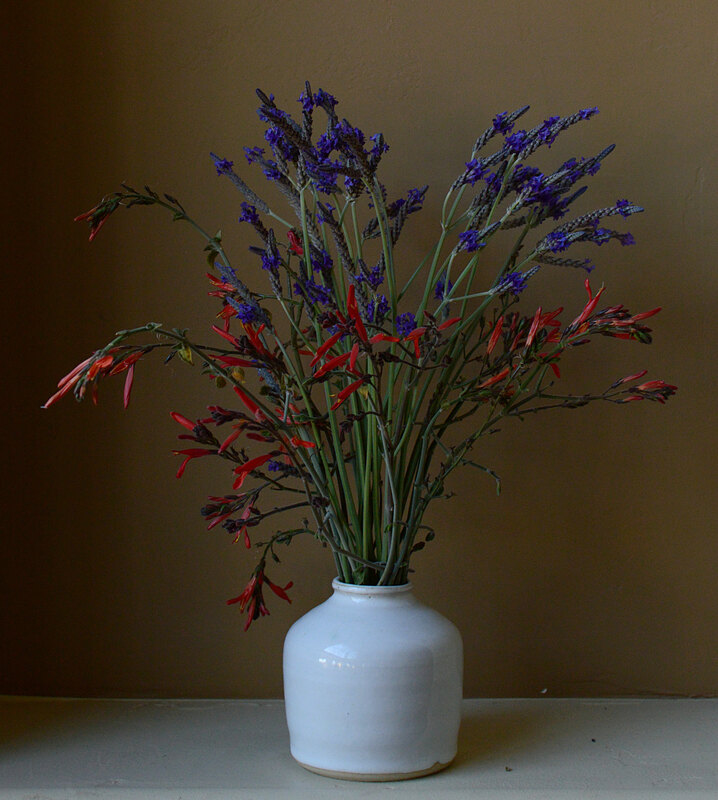 I used my white-glazed stoneware pot again this week because its simplicity seemed well suited to a vase full of only two kinds of flowers. Also because there were quite a few stems to accomodate and those of the chuparosa are extra thick and succulent. Thanks to Cathy for faithfully hosting In a Vase on Monday each week, to inspire us gardeners to bring some of the garden's bounty indoors! 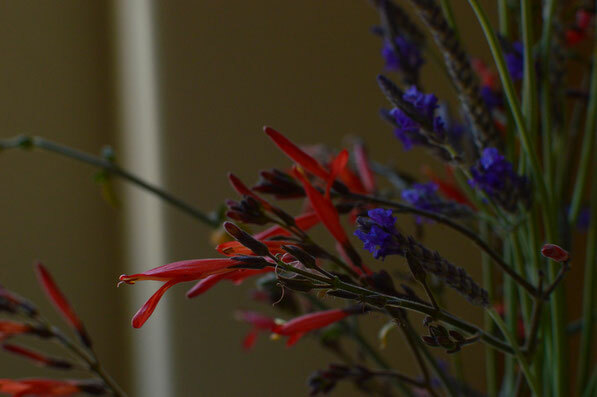 Lovely colourful spikes today, Amy, in that shapely vase again! Love this combination; the wide bottomed pot was a great choice. Perfect vase. 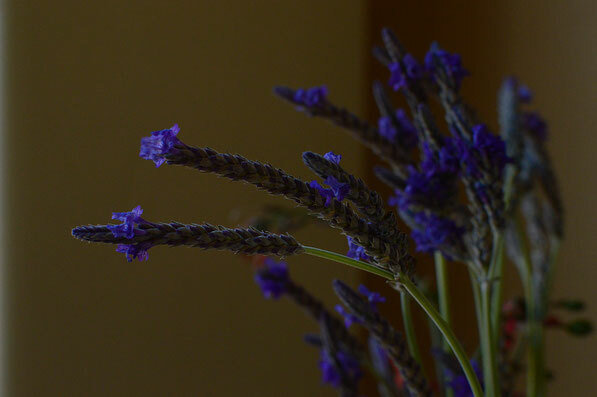 Isn't Lavandula multifida a wonderful plant?! I haven't tried growing that Justicia - I must remedy that. The word that comes to mind...... elegant! Very stark and effective colour contrast, Amy. We have an ex-politician and now travel broadcaster, Michael Portillo, currently touring the US by rail, who wears combinations like this. Google him. I love the quiet energy in those elegant stems, and that gorgeous little white vase grounds the whole arrangement perfectly. Simply gorgeous! Derek - Thanks so much! :) That's certainly one word I'm happy to have applied to it! 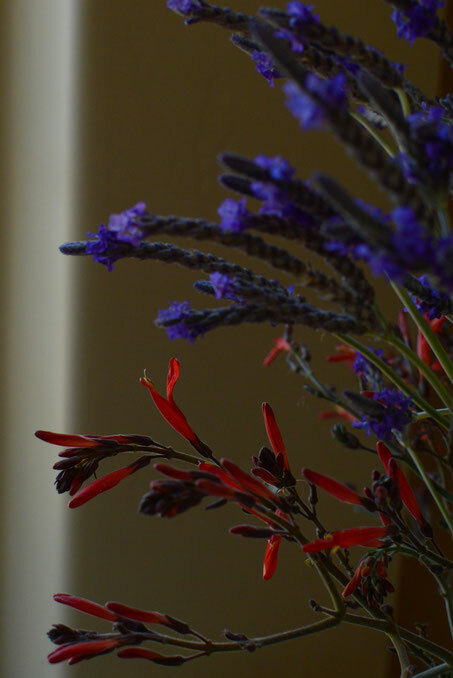 The narrow stems and flowers impart so much mystery, as do the deep, contrasting colors. Proving that Sonoran and Mediterranean can look great together. I'm pleased you looked up our Michael. Growing up in Los Angeles in the seventies. 'Flower Power' certainly took hold. Or was that San Francisco? (400 miles apart showing ignorant me just how big California is.) Portillo was visiting Los Angeles on Friday - he may be there for tonight's episode - and what I most noted was just how Mexican or Spanish it is.